Have you ever been really excited to be invited to spend the night at a friend's house, only to get there and feel nervous because their house seemed so different from your own? Perhaps the house was so much smaller than yours. Maybe they had more kids in the family from yours. They ate different kinds of foods than you did at your house. Your friend's bedroom was way different from your own. You were not sure what to say to your friend's parents. You think, "Why did I say I would stay here? I'll never be able to sleep. Maybe I should go home." But you end up staying and find out that it really isn't so different from your house. Your friend's parents are really nice. You try the food they serve and it's not so bad. After checking out your friend's bedroom you find that it's really not so different from your own, it's just that similar things are in different places. Then you pop some popcorn and turn on a movie (a Jackie movie perhaps?) and you don't feel so far away from home after all. The next day you think to yourself, "I can't wait to come back again. That was fun." That's kind of how it was for our family when we went to Hong Kong in August for Jackie's fan club party. At first things seemed so different from our home in Madison, Wisconsin USA. But it wasn't long before we found some familiar things and really started to feel not so far from home. We ( Nic-17 years old, Stephanie-14 years old, their dad Mark and myself) were very, very excited about the trip to Hong Kong. We had never taken a real family vacation before. 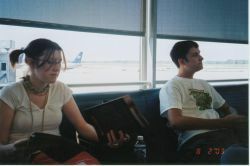 We had never flown on an airplane to visit another place, much less to go out of the country. We were going to meet Kath, the Kids Club president. We were going to see Jackie. We were going to be away from home for over a week! Wow, exciting. We couldn't wait! Waiting at the airport in Chicago. 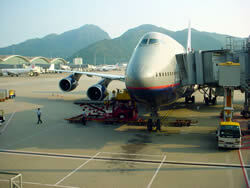 This is the plane that took us from the US to China! Our flight to Hong Kong took off from Chicago, and this is where we would meet Kath. As the time got closer for her flight to come in from New York, the excitement we felt at meeting her turned into a little bit of nervousness. Well, two minutes after meeting her, the nervousness was gone. She was everything we thought she would be. Friendly, easy to talk to, and funny. We were comfortable with her before we even got on the plane. Why were we even nervous? 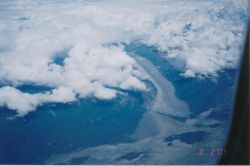 This is a view of Alaska from our plane! The flight was looong but fun. Things were a little strange at first, but soon we were familiar with the routine. Most of the flight attendants were Asian, but they all spoke English very well. We were offered Chinese tea, but there was also soda available. Many of the passengers on the plane were Asian and were speaking Chinese, but they were doing the same things we were doing: chatting with the person next to them, looking at the view out the window, reading, watching the movies, eating, and of course, sleeping. Like I said, it was a looong flight. The plane landing in Hong Kong brought on a new wave of nervousness. We had to find our luggage. We had to get Hong Kong money. We would have to USE Hong Kong money. We had to get to our hotel. But, yet again, we found that we didn't need to worry. A Hong Kong ten dollar coin. Everyone at the airport was very nice and helpful. Unlike the Chicago airport, there were many airport workers available waiting to help us. 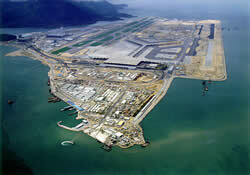 It was much easier to get around the Hong Kong airport than the Chicago airport, and we found our luggage quickly. We exchanged our money and bought transportation passes at the same counter at the airport. Everyone spoke English well and was able to answer any questions. Whew! Now to get to the hotel.